At the beginning of Le Rouge et le Noir Julien is faced with two escape routes from his working class poverty; that of the army and that of the clergy. It is this dualistic choice between the military and the priesthood that is the most common interpretation of the colours of the enigmatic title, with the red representing the army and the black the cassocks of the clergy. This reading explains the choice of many English translators to translate the more neutral 'Rouge' (red) with Scarlet, a certain type of red with military associations. This equation of red with the army is not particularly convincing, particularly as the French army wore blue tunics (it was the enemy British who famously wore scarlet tunics), and the only uniform Julien wears in the novel is in fact sky blue. 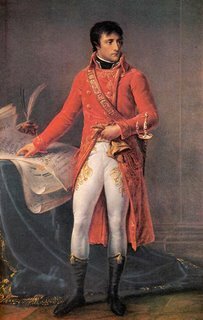 However, it may refer to the red uniform/cloak worn by Napoleon as general and First Consul (see the painting by Gros to the left) or perhaps to the red sash of the Legion of Honour. Other interpretations have been forwarded, including reference to the red and black roulette wheel indicating the risks taken by Julien, and the theory that equate red with republican forces and the black with the Church. "[...] the endlessly debatable connotations make Le Rouge et le Noir a fitting title for a novel which is itself open-ended and a constant invitation to conjecture." Stendhal’s Violin (Oxford: Clarendon Press, 1988), pp. 132-134 footnote 19. These pages contain a good summary of the various interpretive readings of Le Rouge et le Noir, as well as references for further reading.